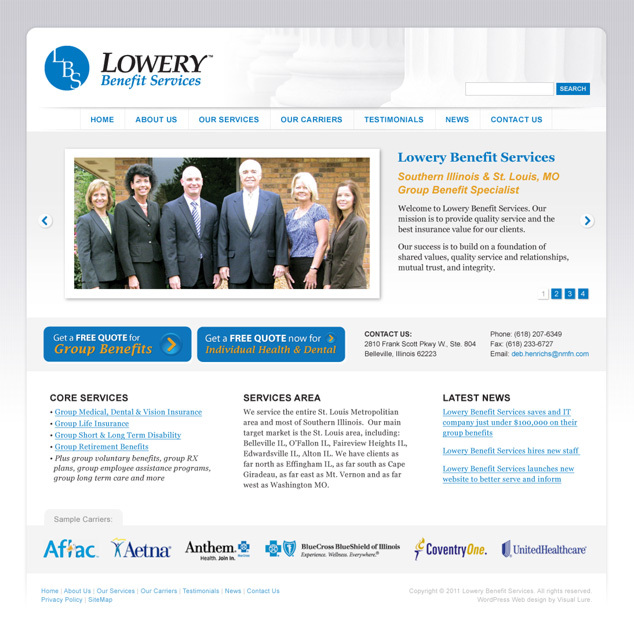 Visual Lure was recently contracted to design a new Word Press website for Lowery Benefit Services, a St. Louis Metro East group benefits company based out of Belleville, IL. They specialize in group medical, dental & vision insurance, group life insurance, group short & long term disability and group retirement benefits along with a substantial amount of secondary services. The new website will be built in Word Press which will allow the Lowery staff to easily maintain the site in-house. The website will also have the ability to provide individuals with instant free quotes on health & dental insurance using a third party integrated service. Below is our proposed home page design. Check back soon for the official launch of the new website. Learn more about our Word Press design and web design services. Also, don’t forget to check out our web design portfolio.